Home Employee Provident Fund	How To Withdraw PF When The Company Close? How To Withdraw PF When The Company Close? Know How To Withdraw PF When The Company Close? 1: If You are currently working in any Company / Establishment. 2: You are not working in any Company / Establishment. a. Check your current UAN is active or not (ideally it would be one uan for all the companies but in many cases where KYC not completed and due to mismatch data another UAN generated). b. If your uan not activated than activate your uan and login into UAN member area. c.Check uan KYC Completed or not and your aadhaar, PAN and Bank details Verified or not. If KYC not yet completed and verified than complete it. Know how to complete KYC on UAN member portal? d. If the closed company uan number is different from the current uan in that case club your previous company uan into current uan. Be careful while selecting the employer who can verify it, select the current organization who can verify your uan so that it can be easily clubbed and your previous company uan and pf will be merged with the current uan. e. Now You can withdraw or transfer your pf online or offline. If you want to withdraw or transfer your pf online watch this video and follow the process shown in this video. If you want to withdraw or transfer your pf offline in that case you have to fill composite claim form (Aadhaar) in this form you no need to get the form signed by employer and deposit or send to your EPFO Office. 2- You are not working in any Company / Establishment. Here also two scenario A & B. A: You have UAN and your KYC completed and verified on UAN portal. B: Either you don’t have UAN or You have UAN but Your KYC not completed and not verified on UAN Portal. A : You have UAN and your KYC completed and verified on UAN portal. a.Login into your UAN member portal. b. As your KYC completed than go to claim section and apply for withdrawal and fill the Form 19 and 10c online for full and final withdrawal of PF and Pension amount. Watch this video and follow the process shown in this video to know the Complete Process of Online PF withdrawal. c. IF Date of Exit not mentioned in your PF. In that case, you have to fill composite claim form (Aadhaar). In this form, you no need to get the form signed by the employer. You can deposit or send Form directly to your EPFO Office. How to fill composite claim form (Aadhaar)? Documents required with the composite claim form (aadhaar)? B: Either you dan’t have UAN or You have UAN but Your KYC not completed and not verified on UAN Portal. 1. You have to fill the composite claim form (Non-Aadhaar), in this form and supporting documents of your kyc you have to get attested by any gazetted officer or Manager of Bank (PSU preferred or where you have a saving account) or Magistrate or Post Master or Notary. 2. Write a letter to regional EPFO stating the reason for not getting attestation from an employer (in your case it will be company closed). 3. Send the filled form to regional EPFO along with all the required documents and letter. 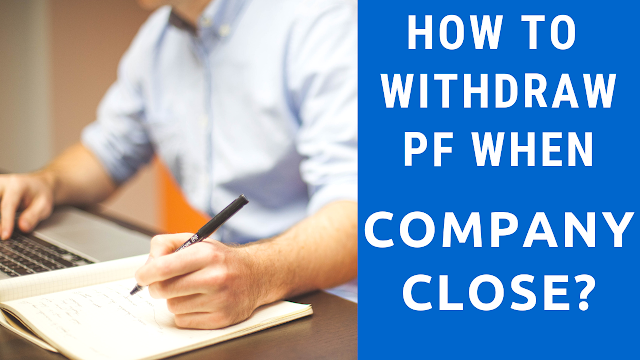 Let us know about this article “How To Withdraw PF when the company Close” by commenting below. Also, you can subscribe our channel Sab Kuch Online for an informative video.